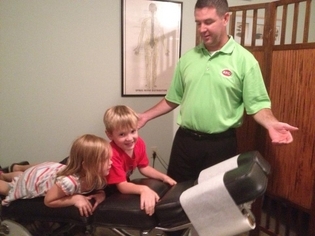 Welcome to Brown Family Chiropractic! It is our focus to help you improve your quality of life. Our mission has been and always will be to provide effective, quality, and individualized care to our patients so they can foster a healthier lifestyle. Feeling healthy is not just being pain and symptom free, it is more of your body's ability to function at an optimal level. For healthy families, chiropractic care is an integral part of their overall wellness plan and a vehicle to achieve optimal health and function. At Brown Family Chiropractic we believe the whole family, from the youngest baby to the greatest grandparent can benefit from chiropractic care. Please take a moment to look through this website and learn why Brown Family Chiropractic has been voted Quincy's Best Chiropractic Services for 2006, 2007, 2008, 2009, 2010, 2011, 2012 and 2013! Our wonderful staff has helped so many people feel better through natural chiropractic care, and we would love the opportunity to assist you in leading a healthier lifestyle. Brown Family Chiropractic Welcomes You To Our Office!